Download "CENTER FOR LABOR MARKET STUDIES"
2 Introduction Over the past twelve years (-12), the nation s labor markets have performed quite poorly, marked by the worst job creation performance since the end of World War II and rising levels of unemployment, underemployment, and hidden unemployment. 1 Both the nation s teens (16-19) and young adults (-24) have fared the worst in the labor market by far, experiencing the greatest decline in their employment rates over this time period while the nation s older adults (57 and older) improved their employment rates over the same time period. 2 The employment rates of the nation s teens over the past few years have reached new historical lows for the post-world War II period, with all demographic, socioeconomic, and schooling groups of teens characterized by deep drops in their employment rates. High school students and young high school dropouts have experienced the greatest differences in securing any type of paid employment in recent years. This lack of in-school employment has led to difficulties in young graduates transitioning to the labor market upon graduation. Previous research work by the authors of this paper has revealed that the ability of young high school graduates, especially those not enrolling in college, to successfully transition from high school to the world of work upon graduation has been very adversely affected by these labor market developments over the past 12 years. 3 These young graduates have experienced both declining employment rates and a sharply reduced ability to secure full time jobs, especially among Blacks, Hispanics, and low income youth. Their full time employment rates have fallen to near historical lows in recent years. 4 Given the high degree of path dependency in teen and young adult employment, these low amounts of work experience in the early school-leaving years will have future adverse 1 For a review of these alternative labor market problems, see: Andrew Sum and Ishwar Khatiwada, Going Beyond the Unemployment Statistics: The Case for Multiple Measures of Labor Underutilization, Mass Benchmarks, Volume 14, Issue 2, For a detailed review of the deteriorating labor market fortunes of teens (16-19) and young adults (-24) in the U.S., since, see: Andrew Sum, et al., Key Findings on the Labor Market Experiences of Teens and Young Adults (16-24 Years Old) in the U.S. from -12, Paper Presented to Pathways to Prosperity Conference, Harvard University, Graduate School of Education, Cambridge, October Andrew Sum, Ishwar Khatiwada, and Sheila Palma, The Continued Crisis in the School-to-Work Transition of the Nation s Non-College Bound Youth, Paper Presented to the JAG National Conference, Orlando, Florida, July These estimates are based upon findings of the October Current Population Surveys (CPS), which contain a supplement that tracks the college enrollment and employment outcomes of each year s high school graduating class. For findings of the October 12 Survey, see: U.S. Bureau of Labor Statistics, College Enrollment and Work Activity of 12 High School Seniors, Washington, D.C., April 13. 3 effects in terms of lower rates of employment, lower wages, and reduced training from employers. 5 The low employment rates of these young high school graduates also were influenced by their considerably lower degree of exposure to work during their high school years. The employment rate of year old high school students in the United States fell from 34 in to only 16 in 12, a new record low for the past 27 years for which high school employment data are available from the Current Population Survey. 6 This policy brief is primarily designed to describe and assess the employment experiences of those high school graduates from the Class of 12 who did not enroll in college in the fall immediately following graduation. The share of each year s high school graduating class who enrolled in college in the fall of the year of graduation had been rising in the U.S. from 1 to 9 when it peaked at slightly over 7, an all-time high for this data series. However, the college enrollment rate has declined steadily since then, falling to 66 for the Class of The employment rates of these non-college enrolled high school graduates from the Class of 12 will be estimated for all such graduates and for gender, race-ethnic, and family income subgroups. 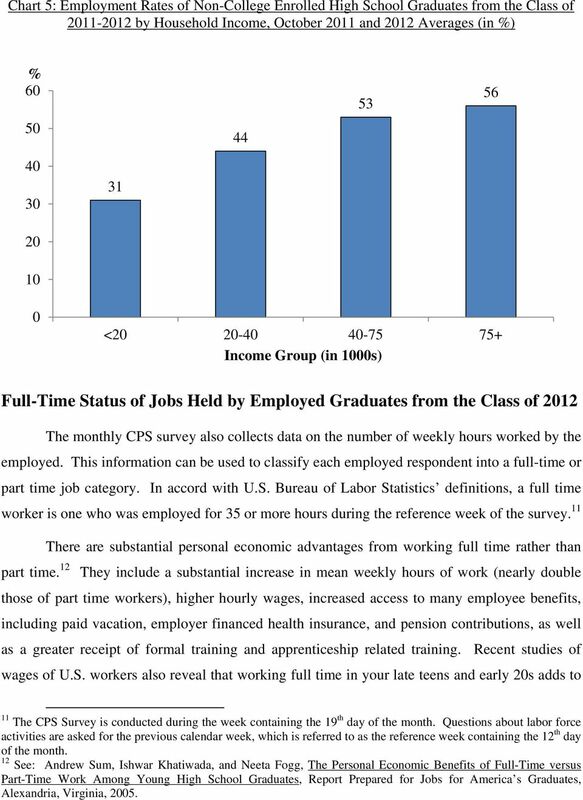 Findings from the Class of 12 will be compared to those for previous graduating classes in recent years (9-11) and in some cases back to The ability of these employed high school graduates from the Class of 12 to obtain full time jobs (35 or more hours per week) will then be examined, with separate breakouts of the data for gender, raceethnic, and family income groups together with comparisons of such findings for selected graduating classes dating back to. The final section of the policy brief will review findings on the full-time employment rates of those graduates from the Class of 12 who did not enroll in college in the fall of that year. These full-time employment rates will be provided for gender, race-ethnic, and gender/race-ethnic groups and compared to those for selected graduating classes back to. It will be shown that the full-time employment rate for Class of 12 graduates not enrolled in 5 For earlier reviews of these path dependency effects, see: (i) Joseph Mclaughlin, Andrew Sum, et al., Still Young, Idle, and Jobless : The Continued Failure of the Nation s Teens to Benefit from Renewed Job Growth, Center for Labor Market Studies, Northeastern University, Boston, 7; (ii) U.S. Department of Labor, Bureau of Labor Statistics, Employment of Teenagers During the School Year and Summer, Washington, D.C., 4. 6 See: Anne McDougall Young, New Monthly Data Series on School Age Youth, Monthly Labor Review, July 1985, pp See: U.S. Department of Labor, Bureau of Labor Statistics, College Enrollment and Work Activity of 12 High School Graduates, Washington, D.C., April 13. 4 college was the lowest ever recorded with Black males being characterized by an amazingly low 5 full time employment rate. These employment results for all non-college enrolled graduates represent a national economic and social disaster. Methodology: Key Employment Measures and Data Sources The employment measures for new high school graduates used in our analysis are derived from the October Current Population Survey (CPS) from 1989 through 12. The October CPS is a monthly household survey conducted by the U.S. Census Bureau for the Bureau of Labor Statistics. It is used to calculate and measure the civilian labor force, the number of employed and unemployed persons, employment/population ratios, unemployment rates, the labor force reserve or hidden unemployment, underemployment, and other labor force underutilization measures. In addition, the October CPS identifies all individuals that graduated from high school in the previous month period, and collects information on their college enrollment status, their employment status, their weekly hours of work and their hourly wages. This paper is focused on the employment status of those graduates who were not enrolled in college in October of the year of their graduation. Slightly more than 3.2 million teens and young adults (16-24) graduated from high school at some point between January and October of The annual number of new high school graduates across the nation has held fairly constant at between 3.1 and 3.2 million over the past three years, but the future number of graduates will be declining as the size of the nation s teenaged population begins to fall due to the declining number of births from 1996 onward. The national CPS survey completes interviews with about 6, households per month. In October 12, the CPS survey identified 1,255 individuals who graduated from high school between January and October of 12. Of these 1,255 high school graduates, nearly 8 were enrolled in college in October of 12. The non-college enrolled sample of high school graduates consists of about 456 individuals, whose weighted results are representative of the national population of such new graduates. This paper focuses on their ability to obtain employment and their success in finding full time jobs. 8 Ibid., p.1. 5 Time Trends in the Employment Rates of the Nation s Non-College Enrolled High School Graduates, Until recently, the ability of the nation s teens to obtain employment had been found to be quite cyclically sensitive over the past five decades. 9 Teen employment rates typically rose at above average rates during periods of job growth and declining aggregate unemployment and fell at an above average pace during periods of recession and jobless recoveries, such as the recovery from late 1 to the fall of 3. The employment rate of teens in the U.S. did not, however, rise to any substantive degree during the economic recovery from 3-7 and have failed to increase during the current job recovery from the Great Recession of 7-9. From the fourth quarter of 9, the low point for total employment in the U.S. following the end of the recession in June 9, through the second quarter of 13, total civilian employment (persons 16 and older) increased by nearly 5.5 million while teen employment fell by 43, over the same time period. Time trends in the employment rates of the nation s newest classes of high school graduates who did not enroll in college in the fall immediately following graduation reveal similar patterns to those of all teens (16-19) regardless of their educational attainment or school enrollment status (see Chart 1). In October 1989 at the near end of the economic boom of the business cycle, 72 of all new graduates not in college were employed. 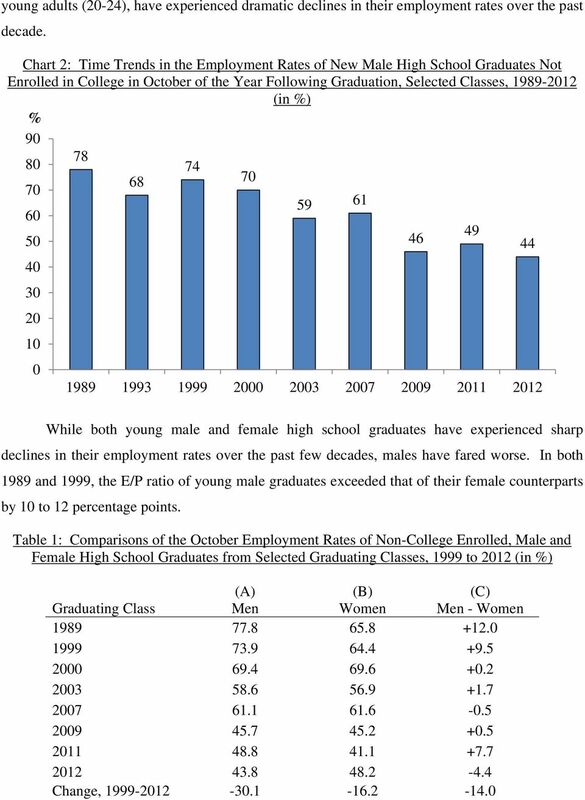 During the economic recession of and the largely jobless recovery through early 1992, the employment rate of the nation s new high school graduates not enrolled in college fell to 64 in As the national labor market improved strongly and steadily from 1993 through, adding 18.6 million more employed civilians, the employment rate of new high school graduates also increased, rising to 7 in both October 1999 and October. 9 The tendency for teen employment rates to rise during periods of economic prosperity and job growth did not hold true during the 3 7 economic recovery in the nation, a historic anomaly. The previous tendency was for teens to benefit at an above average rate. 6 Chart 1: Time Trends in the Employment Rates of New High School Graduates Not Enrolled in College in October of the Year Following Graduation, Selected Classes, (in ) The national recession of 1 and the largely jobless recovery through the early fall of 3 took a severe toll on the labor market fortunes of young high school graduates. By October 3, their employment rate had declined sharply to 58, and would increase by only three percentage points to 61 by October 7. During the Great Recession of 7-9, the employment rate of new high school graduates not enrolled in college declined sharply, falling to 46 in 9 (a new historical low since the published series began in 1965) and remaining there in both October 11 and October 12. These are the lowest employment rates for new noncollege enrolled high school graduates in the U.S. since the data series began in Young males in the U.S. have fared even worse than non-college enrolled females over the past few decades, especially since (Chart 2). In October 1989, 78 of male high school graduates not enrolled in college were employed. Their employment rates fell steeply to 68 in 1993 and then improved back to 74 in By 3, their employment rate had declined sharply to 59, an all time low for men, and rose only marginally by 7 to 61. During the Great Recession, their employment rate had dropped steeply to 46 by October 9 and fell further to a new all time low of 44 in October 12. Young males in general, both teens and There was a temporary blip up to 5 in but it fell back to 46 in October 11. 9 There were even considerably larger disparities in teen employment rates across combined gender/race-ethnic groups. Among both Blacks and Whites, women were more likely to be employed than men while the opposite held true among Hispanic graduates (see Chart 4). The October 12 employment rate of these young high school grads ranged from lows of 14 among Black men and among Hispanic women to highs of 55 and 6 among White men and women, respectively. White non-hispanic female grads were four times as likely to be employed as young Black males. Chart 4: Employment Rates of Non-College Enrolled High School Graduates from the Class of 12 in Gender and Race-Ethnic Groups as of October 12 (in ) Black Men Hispanic Women Hispanic Men Black Women Gender / Race-Ethnic Group White Men White Women Given the myriad set of economic advantages of growing up in a more affluent family, including being located in a more favorable labor market environment and having the job brokering services of one s parents, relatives, and neighbors, it should come as no surprise to discover that high school graduates from the Class of 12 who lived in higher income families were more likely to be employed in October 12 (see Chart 5). High school graduates from the lowest income group (under $,) had an employment rate of only 31. This job holding rate increased to 44 for those with family incomes between $, and $4, and peaked at 56 for those graduates living in families with incomes above $75,. The highest family income group of graduates was about twice as likely to work as the lowest income group. 10 Chart 5: Employment Rates of Non-College Enrolled High School Graduates from the Class of by Household Income, October 11 and 12 Averages (in ) < Income Group (in s) Full-Time Status of Jobs Held by Employed Graduates from the Class of 12 The monthly CPS survey also collects data on the number of weekly hours worked by the employed. This information can be used to classify each employed respondent into a full-time or part time job category. In accord with U.S. Bureau of Labor Statistics definitions, a full time worker is one who was employed for 35 or more hours during the reference week of the survey. 11 There are substantial personal economic advantages from working full time rather than part time. 12 They include a substantial increase in mean weekly hours of work (nearly double those of part time workers), higher hourly wages, increased access to many employee benefits, including paid vacation, employer financed health insurance, and pension contributions, as well as a greater receipt of formal training and apprenticeship related training. Recent studies of wages of U.S. workers also reveal that working full time in your late teens and early s adds to 11 The CPS Survey is conducted during the week containing the 19 th day of the month. Questions about labor force activities are asked for the previous calendar week, which is referred to as the reference week containing the 12 th day of the month. 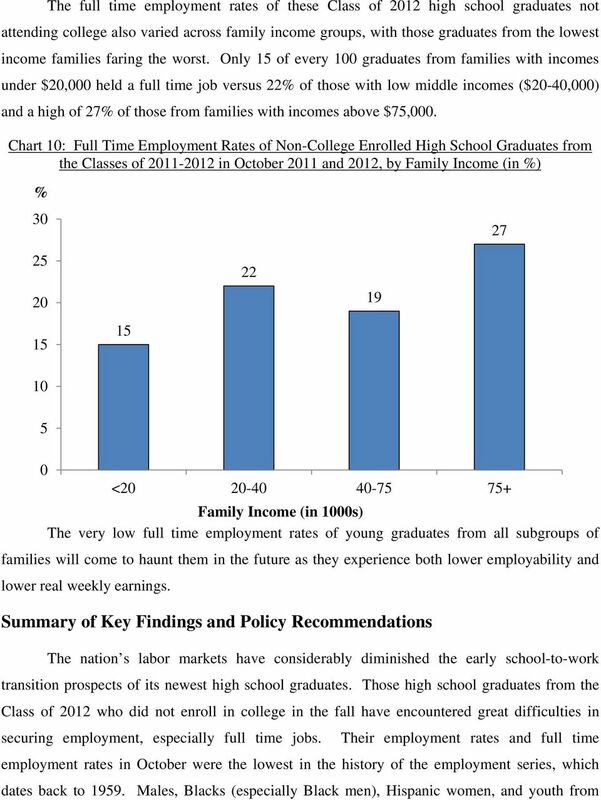 12 See: Andrew Sum, Ishwar Khatiwada, and Neeta Fogg, The Personal Economic Benefits of Full-Time versus Part-Time Work Among Young High School Graduates, Report Prepared for Jobs for America s Graduates, Alexandria, Virginia, 5. 11 your real hourly wages in your mid to late s while part time employment has no long term wage advantage. 13 The ability of employed high school graduates not attending college to secure full time jobs in the early fall following graduation has declined nearly steadily and dramatically since. In October, 69 of employed high school graduates were holding a full time job. By 3, the share of jobs held that were full time dropped to 61 and stayed there in 7. During the Great Recession, the full-time share of jobs plummeted to 46 and then fell to 43 in October 12, the lowest full time job share ever recorded in this data series. Chart 6: Percent of Employed, Non-College Enrolled Graduates from Selected Graduating Classes to 12 Who Were Working Full Time in October of Year of Graduation all time low The percent of jobs held by young high school graduates in October 12 that were full time varied widely across gender and race-ethnic groups. Only one-third of employed women worked full time versus one half of employed male graduates. Across the three major raceethnic groups, the share of the employed working full-time ranged from a low of 29 among Blacks to a high of 55 among Hispanic graduates, a near two to one difference from top to bottom. 13 See: Francine D. Blau and Lawrence M. Kahn, The Feasibility and Importance of Adding Measures of Actual Experience to Cross Section Data Collection Journal of Labor Economics, Volume 31, Number 2, April 13, pp. S17 to S58. 12 Chart 7: Percent of Employed, Non-College Enrolled Graduates from the Class of 12 Who Were Working Full Time in October 12 by Gender and Race-Ethnic Group Men Women Black not Hispanic Gender / Race-Ethnic Group Hispanic White not Hispanic The Full Time Employment to Population Ratio of Non-College Enrolled Graduates from the Class of 12 The findings on the employment rates of non-college enrolled high school graduates can now be combined with the share of the employed working full time to calculate their full time employment-to-population ratios. 14 Given the declines in both the employment rates and the share of the employed holding full time jobs over time, these full time employment/population ratios had to drop dramatically over the -12 time period. In October, nearly half (48) of all non-college enrolled graduates from the class of held a full time job (see Chart 8). By 3, this full time employment rate dropped sharply to 35 and only increased back to 38 in October 7, shortly before the onset of the Great Recession of 7-9. By 9, this full time employment rate had declined to 21, a new record low, remained at 21 in 11, then fell to a new historical low of 19 in October 12. In that month, only 19 of every high school graduates from the class of 12 who did not attend college in the fall were employed full time. 14 Algebraically, FE / P = E/P * FE / E where E/P = employment/population ratio, FE/E = of employed working full time. 15 low income families have experienced the most severe difficulties in making the transition to the labor market in the past 52 years. In spite of this massive breakdown in the early school-to-work transition process, neither the Obama Administration nor the U.S. Congress has offered any new policy initiatives to address this serious labor market problem. There is a clear and overwhelming need to provide new funding to support high levels of in-school employment among the nation s high school youth, programs such as Jobs for America s Graduates to provide personal, intensive employability skills and job placement services to graduating seniors to help them make the transition to the labor market upon graduation, and an expansion of the numbers and occupational breadth of apprenticeship training programs. Our youth are being failed in the early labor market transition period to the greatest extent ever in the past 5 years. The U.S. is no longer close to being a national leader in putting teens to work. The time for action is now. 820 First Street NE, Suite 510 Washington, DC 20002. Tel: 202-408-1080 Fax: 202-408-1056. center@cbpp.org www.cbpp.org.